For solo guitar or two guitars. Composed by Jurgen Kumlehn. 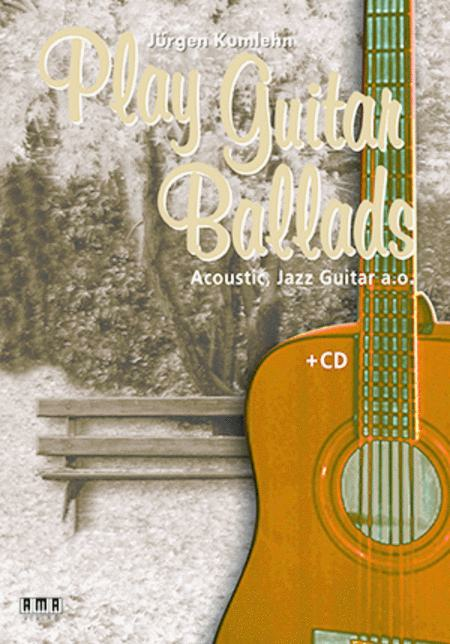 Saddle-stitched, Jazz, Latin American, Solos, Blues, Folk, Duet and Ensemble. Style. Book/CD set. 80 pages. Mel Bay Publications, Inc #610465. Published by Mel Bay Publications, Inc (MB.610465). ISBN 9783899221893. 9 X 12 inches. Jurgen Kumlehn works as a live and studio guitarist (having made tours with German and international artists such as Ertha Kitt, Roland Kaiser, Howard Carpendale, Georg Danzer, Drafi Deutscher, Dieter Bohlen, Annett Lousian, Vicky Leandros) and graduated from the University of Music in Hamburg where he studied popular music. With Das neue Gitarrenbuch, he has written a bestseller among guitar courses, published by the AMA Publishing House alongside numerous other publications such as Das neue E-Gitarrenbuch, Die AMA-Gitarren-Grifftabelle. This book has become a standard work for modern guitar lessons. 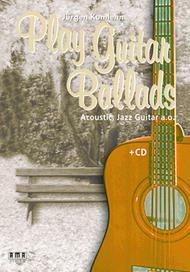 Play Guitar Ballads contains new medium-difficult solos and duets with styles ranging from jazz, Latin, folk and blues. The titles of the pieces already give you an idea of what style the compositions are in. Some pieces are written both in notation and tablature. Some pieces are recorded on the CD with bass, percussion and organ accompaniment, so you get an additional listening experience. Includes Book and CD.